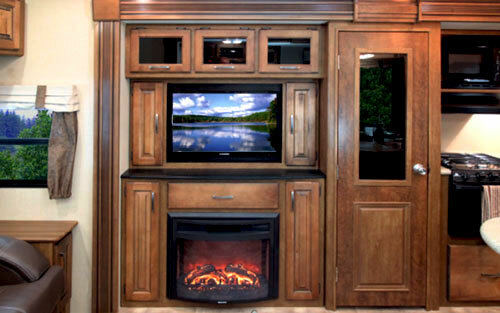 Grand Design RV (located in Middlebury, IN) is a privately-owned company founded just few years ago. 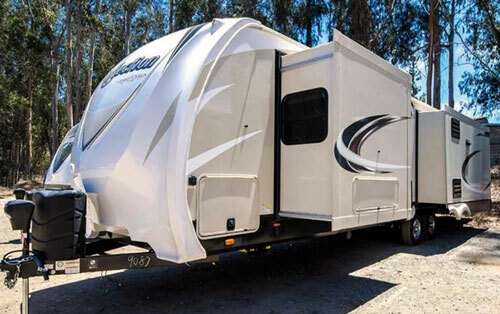 Today, they are one of the largest and most recognized manufacturers of luxurious travel trailers and Fifth Wheels. To ensure potential customers - the success did not come from nowhere. 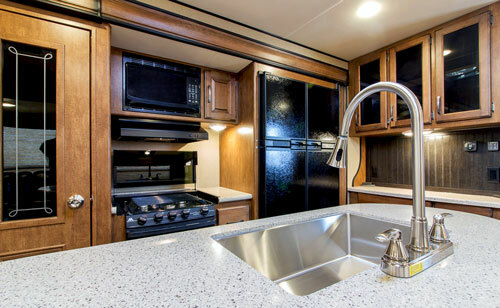 Owners and true “architects” of the new RV business Mr. Don Clark and brothers Ron and Bill Fenech have long years of experience in RV industry (at some time they were part of the leading team at Keystone RV). 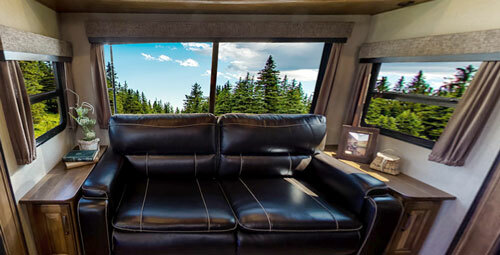 In 2011 the decided to pursue their dreams in RV business by raising the quality bar and re-establishing personal connections with customers and dealers. And this is the “short” story behind the Grand Design RV and its “long” list of achievements…. 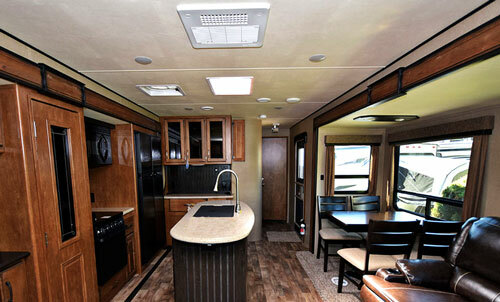 Above: curbside with opened lounge/dinette slide-out. Out of long list of models we will present here the Reflection 315RLTS travel trailer. According to company – this trailer is a “Celebration of luxury and value, example of convenience with high-end style and residential charm” – and all that at an affordable price. The layout offers front master bedroom w bathroom, central kitchen with dining table and rear lounge with entertainment center. 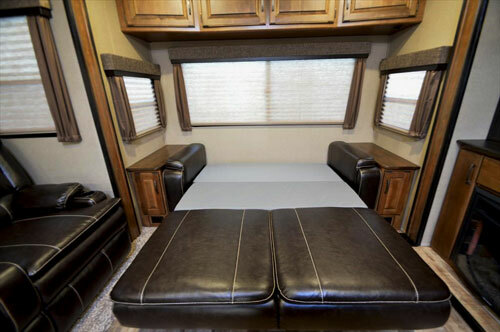 While the bedroom is clearly separated from the remaining part of the trailer to ensure full privacy, the kitchen and the lounge make one spacious living-working and dining area. 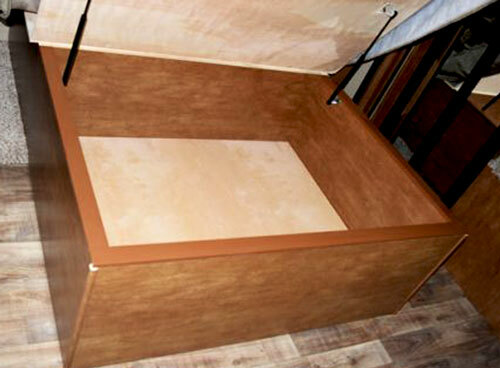 The queen-size bed is placed in the street-side slide-out. With pillow-top mattress and “walk-around” layout it promises residential comfort. Two nightstands offer enough of space for favorite book but also morning coffee. But what really makes the master bedroom residential-like is generous furniture. Trailers’ front-end houses literally king-size closet where you can store/hang a lot of your personal stuff, clothes and everything you may need on the daily basis. As if it is not enough, the bottom part of the closet has a “hidden” storage place (ideal for shoes, but it is up to you how to use it). Another spacious closet and three large drawers is on the opposite side of the bedroom (bathroom side). The large dresser with plenty of drawers is located in front of the bed. Although in place of a traditional mirror there is a large panoramic window for many (especially women) it still will be a kind of “dream comes true” feature. It brings-in the outside world - hopefully nature with its graceful beauty and sunlight (the best combination wake-up “good-morning”). And do not worry about the lack of dresser’s mirror – it is greatly compensated by large mirror sliding doors covering the front closet. To complete the picture let’s note the generous arrangement of headboard cupboards. BTW- two (although much smaller) windows are located on both sides of the headboard to give you first taste of what the weather brings in…. Bathroom is conveniently located near the entrance door next to the master bedroom. 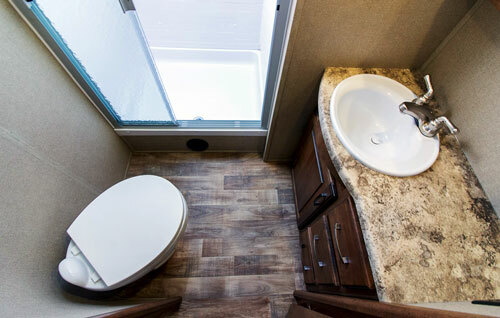 It’s spacious just enough to house porcelain toilet (w/foot-flush), vanity with sink and extra room on countertop (for usual “essentials”), hanging cabinets with mirrors (for towels, toiletries and medicines) as well as the 30” x 36”shower cabin w/sliding doors. The large skylight above the shower, electric vent and HVAC in/outlets help to control air this small space. The bathroom is functional but by no means shares any residential-like similarities. 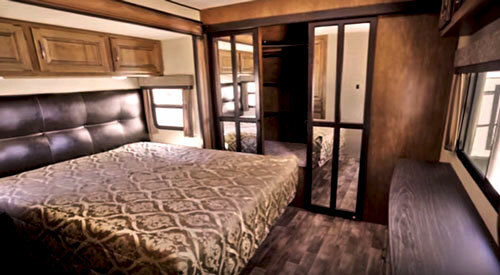 Frankly, more spacious and elegant is the one in Reflection 313RLTS travel trailer. 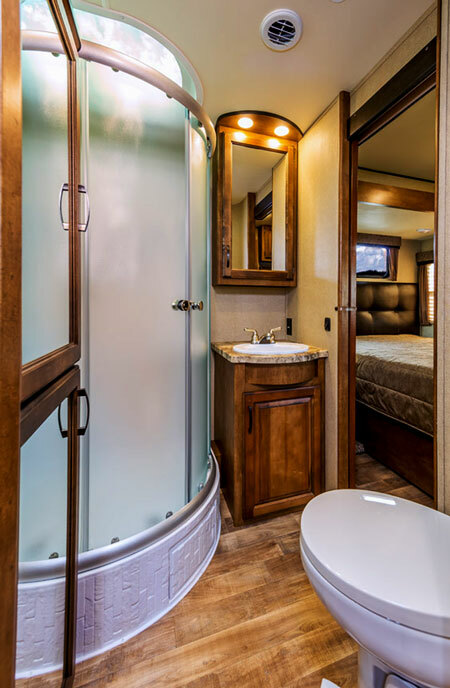 The stylish, rounded-shape shower cabin with radius doors makes big difference. Also the layout takes full advantage of the extra space offering also an extra access from the master bedroom. But all what was achieved in R313RLTS happened at the expanse of its bedroom confirming once again that there is no “free lunch” (in other words always “something for something”). Kitchen occupies the center area of the trailer. And let’s make it clear – with an island, full set of appliances and abundance of cabinets, drawers and countertop space the kitchen not only promises great culinary experience but also seems “inviting” for cooking experiments. The central island houses large stainless steel sink and plenty of free countertop space that can be even farther expanded by sink’s lid. The high, single lever faucet with pullout sprayer makes easier the job. The large cabinet under the island sink is an ideal place for bulky items including trash container. But this is just beginning of the story. 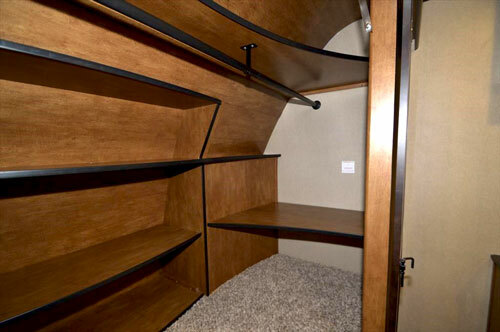 The L-shaped galley shares the large slide-out with the Entertainment Center. Built into space is spacious full-height pantry separating the galley (on the right) from the entertainment section (left). Next to the pantry is a 3-burner gas range with oven and hood (w/vent to the outside). An overhead cabinet above the range holds the 30” wide microwave. 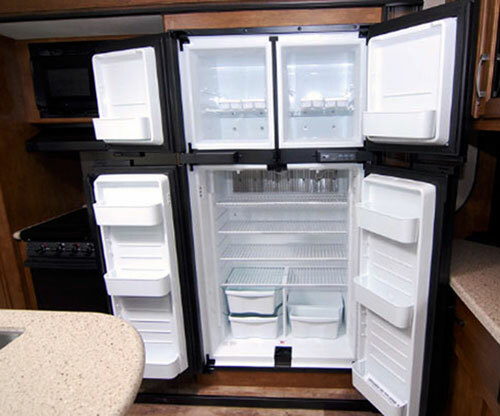 The space to the right houses a “giant” four-doors refrigerator. In fact, 12 cubic feet of controlled-temperature storage for perishables seems to meet expectations of even most demanding “foodies”. The large hutch in the shorter L-leg of the kitchen is the second fixed part of the galley (the other one is the island). It houses impressive countertop with cabinetry (and drawers) below and above. The latter with glass windows adds truly residential feel. The bottom line - It’s a lot of storage and working-space conveniently arranged within the reach of the cook so one may expect delicious “end-results”. Once meals are ready the next steps leads to the dining area. It is located in the 3rd slide-out opposite to the galley (curb-side) and as the galley it shares the space with lounge. The dining table for four is designed as free standing (but bolted to the floor) and comes with comfortable chairs. The residential touch turns-up thanks to large, panoramic windows bringing-in the outside scenery and making the area visually roomier. The drawer that slides-out from the table as well as “under-the-chair-cushion” small storage spaces for “things” are practical accents of anyhow convenient dining space. The concept of living area consisting of two opposing slide-outs results in wide-open space. It inherently brings the feeling of place where you can relax, calm down, enjoy reading, listen to soothing music, watch favorite TV programs or simply warm-up in charming atmosphere created by the fireplace with the help of a glass of wine…. Well, two side-by-side recliners (heated!) on the opposite side of the entertainment center face full FM/CD/Bluetooth stereo, 40” HD TV and an electric fireplace. In fact, this comfortable, leather-finished theater seating with LED-lighted cup-holders and little arm-storage-spaces for books or newspapers may make you think that you are home. 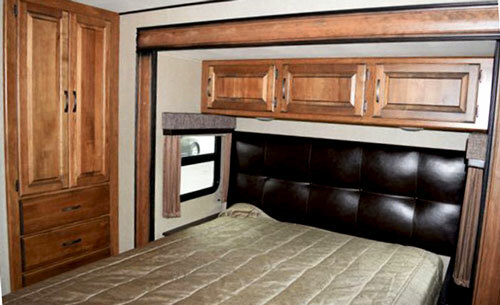 Trailer’s tail houses matching, leather couch (convertible into bed for two). 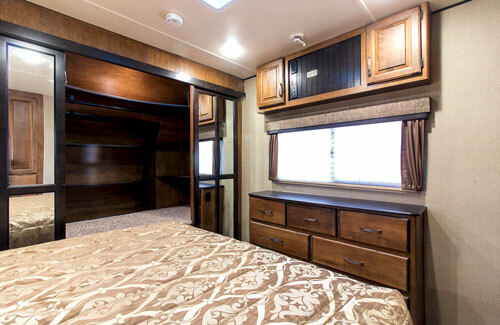 Most (if not all) Grand Design RVs are designed as Extended Stay Vehicles. This implies built-in standard (or optional) features that can make it happen. The large bedroom closet includes wiring and plumbing for washer and dryer. 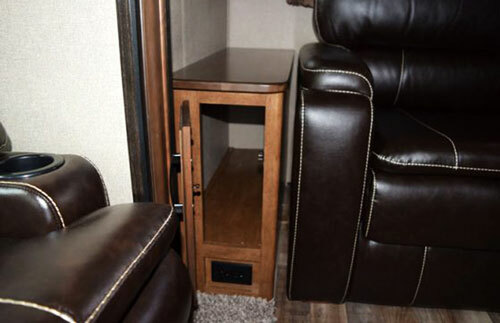 Large “Pass-through” storage at the front offers spacious storage with access from both sides. It also houses an “All-in-one” Docking Station comprising all valves and hook-ups to the outside world (water, drains, shore and solar power etc…). Another large storage with an exterior access is located under the bedroom slide-out. If this is not enough, the trailer comes with the rear ladder and walk-on roof offering an extra space to carry some stuff, The rear receiver also allows for installation of the bike rack. Two power awnings farther extend living area helping to experience more “personal” touch with outdoors. Well, but what if the summer is still far away, busy on the opposite hemisphere or already gone? 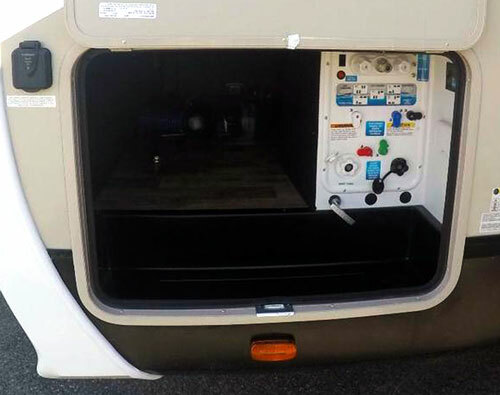 Here comes the Arctic Package with powerful 35k BTU furnace, enclosed and heated underbelly (water tanks, valves …), insulated slide-out floors and improved (double) insulation for roof and front-cap. 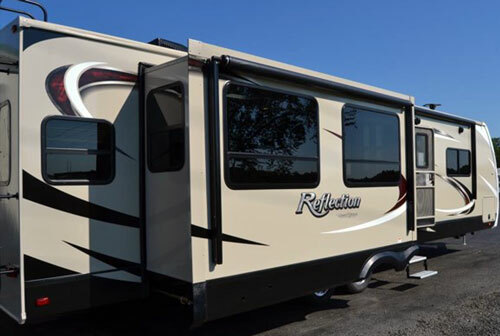 Frankly, in the case of Reflection travel trailer, the Extended Stay capability means you can consider it to be your “Part-Time-Second-Home” …. Like every home regardless if it is your primary residence or mobile one, one of the most important questions you have to ask yourself is the quality of materials and workmanship. Although nothing especially these days is lasting forever - (but that is a different subject), the company tries its best with introduction of 100% Post Delivery Inspection. In other words, each Grand Design RVs can be delivered to market only after going through the (to some extent independent) inspection of some 150+ points…. Well, as I said earlier, such complex RV as Reflection 315RLTS trailer “stuffed” with all kinds of installations, appliances and pieces of furniture exposed not only to “time and human abuse” but also to dynamic stress characteristic to mobile structures (shocks, vibrations) certainly one day will prove that nothing is perfect. It is important however that such day comes not in the near but rather very remote future. And may be the most important numbers – new 2017 models go for just below 50k$ (what seems to be very reasonable given what you get). To make it clear – certainly you have to add to that amount few packages (certainly “Power Package” and most likely “Peace of mind” one), so add to than some extra k-bucks ….